The 70th Anniversary John Lennon J-160E is built in the exacting image of the groundbreaking original J-160E of the 1950s and '60s. Much as with the design of the archetypal jazz guitar, the ES-175, just a few years before, Gibson applied a great deal of forward-looking, out-of-the-box thinking to the design of the J-160E in 1954. Prior to the arrival of this guitar, players of acoustic flat-tops struggled to be heard on stage, performing into inefficient microphones, or hassling with add-on soundhole pickups that usually faired little better. 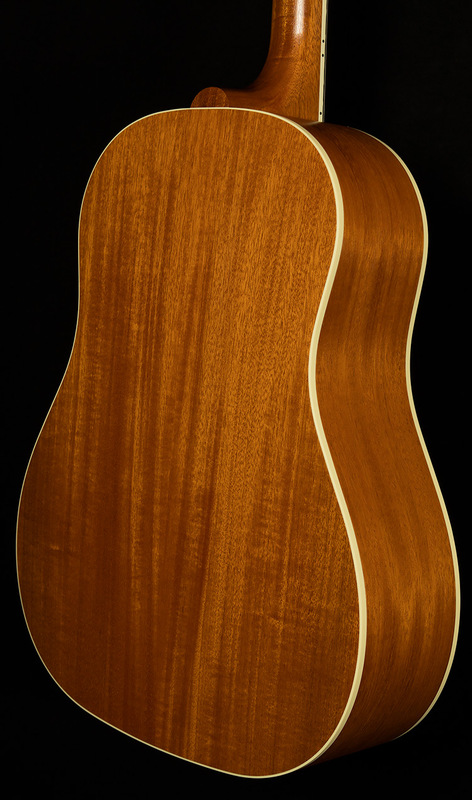 To build one of the world's first truly successful electro-acoustic guitars, Gibson re-drew the blueprint: it crafted a three-layer laminated Sitka spruce top with ladder bracing specifically to resist feedback, used a mahogany back and sides for added warmth and richness, added an adjustable bridge, and installed a P-90 pickup (without traditional cover) beneath the top at the end of the fingerboard, along with a single volume and tone control and a 1/4" output jack. In addition, the guitar's solid mahogany neck was attached at the 15th fret to give performers plenty of access to the highest of the instrument's jumbo frets. 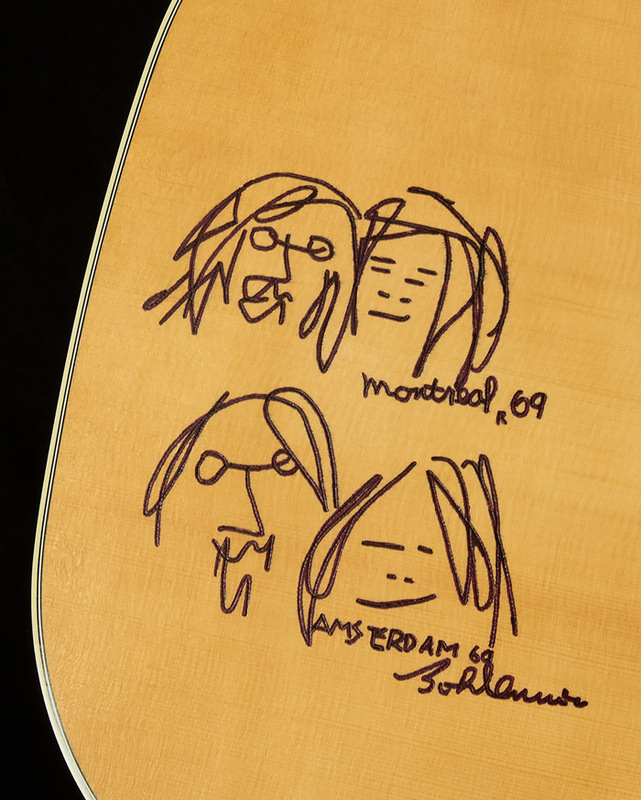 Other historically accurate details on the 70th Anniversary John Lennon J-160E models include its laminated Sitka spruce top, multi-ply top binding, single-ply back binding, traditional soundhole rosette, bone nut, comfortable rounded neck profile and period-correct adjustable acoustic guitar bridge. 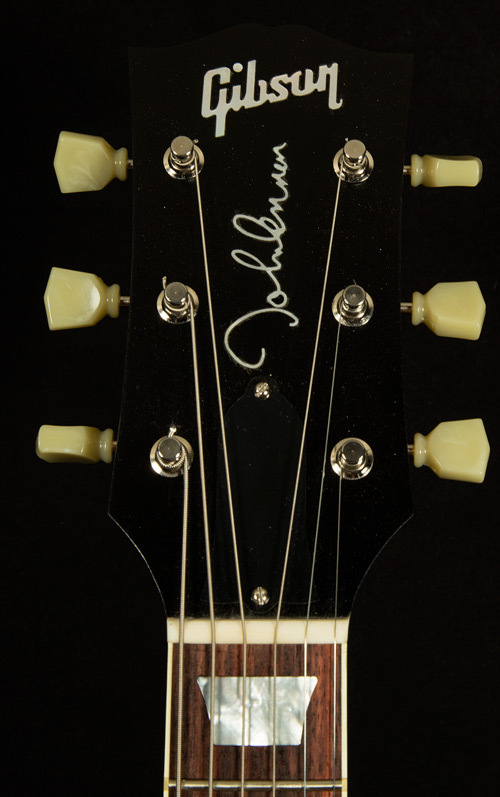 In remembrance of John Lennon, the guitars' headstocks are inlaid with John Lennon's signature, and their Indian rosewood fingerboards carry mother-of-pearl trapezoid inlays with Lennon's date of birth inscribed at the 12th-fret marker. 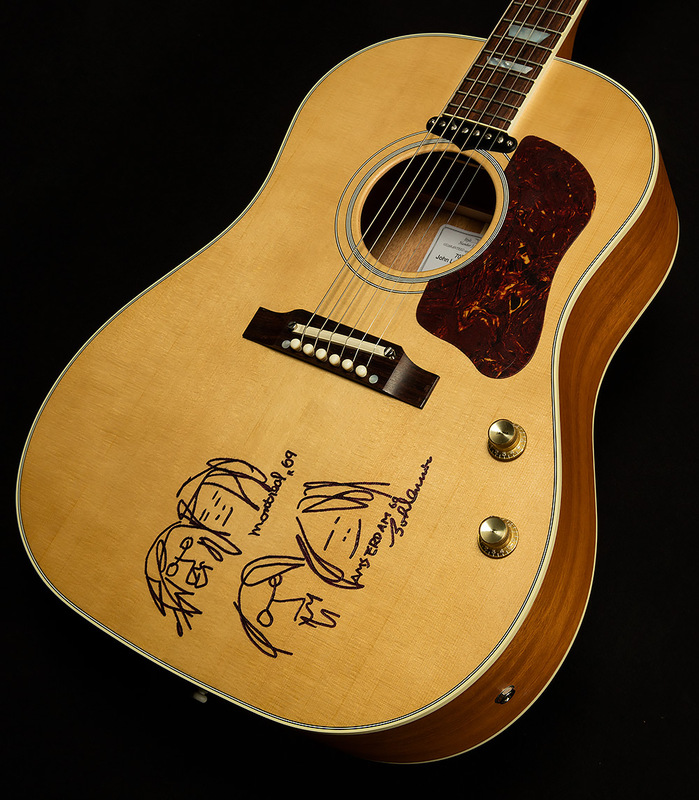 This incredible instrument has no cosmetic flaws to speak of, but it is missing its signed COA from Yoko Ono. Other than that, this collector's piece is in immaculate shape!